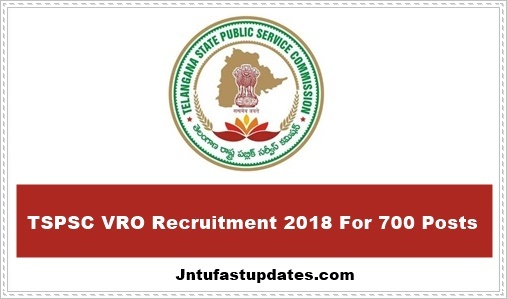 Telangana VRO Notification 2018: TSPSC has released Village Revenue Officer Recruitment Notification for 700 Vacancies in Telangana State. application last date extended up to july 8th. Check TS VRO Recruitment eligibility, exam pattern, syllabus, online apply procedure etc. Students can edit TSPSC VRO Application from august 26th to 28th from below links. Applications are invited Online from qualified candidates through the proforma Application to be made available on Commission’s WEBSITE (www.tspsc.gov.in) to the post of Village Revenue Officer in Revenue Department in the state of Telangana. ii. Last date for submission of ONLINE applications Dt. 08/07/2018. The payment of Fee will not be accepted after 11:59 P.M of last date for submission. The Examination (Objective Type) is likely to be held on 16/09/2018 FN & AN. The Commission reserves the right to conduct the Examination either COMPUTER BASED RECRUITMENT TEST (CBRT) or OFFLINE OMR based Examination of objective type. FEE: (Remittance of Fee) Each applicant must pay Rs. 200/- (RUPEES TWO HUNDRED ONLY) towards Online Application Processing Fee. This apart, the applicants have to pay RS. 80/- (RUPEES EIGHTY ONLY) towards Examination Fee. However, the following category of candidates belonging to Telangana State only are exempted from payment of Examination fee. Mode of Payment of Fee: The Fee mentioned at Para-I(6)(a) is to be paid online through SBI ePay duly following online instructions once the application form details are submitted by filling TSPSC ID, date of birth and other particulars. Sir my name is sowjanya.can I edit my caste certificate number in online vro application sir? Bhaiya VRO exam centre kaha hai ?? ?